Goncalo de Sousa Monteiro, of Buck & Breck in Berlin, made a breakthrough Rum Old Fashioned in 2009. His recipe sees Taylor’s Velvet Falernum liqueur enter the mix, along with overproof white rum and dark rum. While customers may order Old Fashioneds like they are going out of fashion, it’s increasingly likely you’ll see this variation on a menu of the world’s best bars. The Aperol Spritz sees three parts wine, two parts Aperol and one part soda make friends in a glass. As an Italian aperitivo, it is suitable for the hot-weather occasion so its recent popularity in dark, brooding bars isn’t logical. Probably this one came from the consumer, not the trade. Root cause aside, this drink has its own roots in northern Italy, so for authenticity the wine should be from Veneto, preferably Prosecco. Somehow the humble but effervescent Gin Fizz failed to make the top 50 classics list last year, but it’s here now, with 15% of the world’s best bars we polled attesting to its selling power. It’s gin, lime or lemon, sugar, egg (optional) and soda. This is more of a blank canvas drink, yearning for embellishment. This gin-and-lime twosome is a top-10 seller in 18% of the word’s best bars. It’s essentially gin and juice but somehow has credibility beyond its ingredients. Whether with lime cordial or lime juice sweetened with sugar, the ratio was originally 50/50, but that was when people didn’t care much for their teeth. Now a 75/25 gin-to-Roses lime cordial seems to be about the standard. Popularised in Paris in the ’20s, perhaps now the French 75’s louchey heyday is behind it. But the French 75 is up 10 places in our list, with about 20% of polled bars saying it was among their top-10 sellers. At Arnaud’s – home of the drink in New Orleans – it’s made with Courvoisier VS, fresh lemon juice, freshly squeezed, simple syrup, a lemon twist and Mumm Cordon Rouge champagne. Is the Pisco Sour the son of Peru or is it Chile? It’s a long story, but it’s probably Peruvian, with weekend access for the Chileans. All we know is Pisco is fast becoming the new spirit de hipster and the Pisco Sour is the classic cocktail that all pisco drinks must measure up to. White Rabbit from Santiago was one of 22 bars in our poll that named the Pisco Sour a top-10 classic cocktail. One of the machinations of the mind of Victor Jules Bergeron, the Mai Tai has been swept along by the tiki revival and come ashore in many of the world’s best bars. Though down four places in our chart this year, it is a kitsch classic loved by bartenders in their less serious moments. Requested at Artesian last year, it was two parts golden rum, one part orange curacao, one part lime, half part Disaronno and half part simple syrup, all shaken up with ice, strained and served. This Bermuda highball is almost too simple for the label ‘cocktail’. In essence, it is rum’s version of the Moscow Mule. The history goes that British seafarers brought the ginger beer and local distiller Gosling’s met them half way with its rum. They threw in some lime, and there you have it, the Dark ’n’ Stormy. Twists, riffs and embellishments aside, this is a recipe blokes with beards and tats use in the world’s best bars and the world’s best boats. Slipping one place this year it is a top 10 seller in 20% of the bars that featured in our poll. Up three from last year and a top 10 selling classic in a quarter of bars polled is the Bloody Mary. You can argue about the makeup of this drink, but only until you have tried the Connaught’s version. 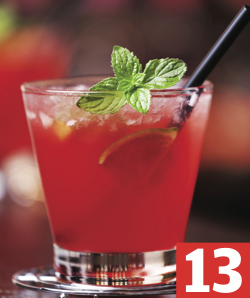 Ago Perone uses Ketel One vodka, fresh tomato juice, a homemade spice mix, fresh lemon juice and celery air. Yes, celery air. It will convert even the bloody-minded Bloody Mary hater.